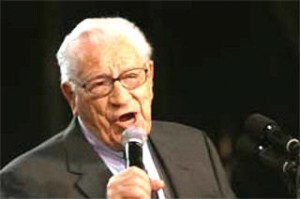 George Beverly Shea is set to receive the Lifetime Achievement Award during this year’s Grammy Awards. Shea, who turns 102 a week before the ceremony (in February), boasts a singing career that spans over 80 years and 70 albums. According to The Recording Academy’s website (www.grammy.com), the Lifetime Achievement Award honours lifelong artistic contributions to the recording medium, and is determined by vote of The Recording Academy’s National Board of Trustees. “It is a great honor to recognize and celebrate such a distinguished and dynamic group of honorees who have been the creators of such timeless art,” said Recording Academy President/CEO Neil Portnow. When asked about his life’s work, Shea responded, “The music has been for God’s glory.” The Lifetime Achievement Award will be given out in a special invitation-only ceremony the week of the Grammys, with an acknowledgment made at the Grammy Awards itself.